I’ve learned a great deal as I progressed through the school of hard knocks to become a professional woodworker. What keeps me involved in writing this blog, magazine articles and teaching, and why you should take advantage of my experience, is the fact that as a professional woodworker, I can help you more easily learn woodworking so you don’t have to pay all of your dues. You get to walk through a few doors instead of having to break them down. Some of the things I learned are general knowledge, such as a highboy base is not the same as a lowboy even though they appear to be the same – I remember how struck I was when I first discovered that. And some things can be applied to every project; or not. As I began to apply shellac to the tall clock, I was again smacked with the idea that all the parts for your project should come from the same tree, if possible. While that’s not always possible, it is a great concept and should be in your mind as you set about a new build. Why? Mostly due to aesthetics. 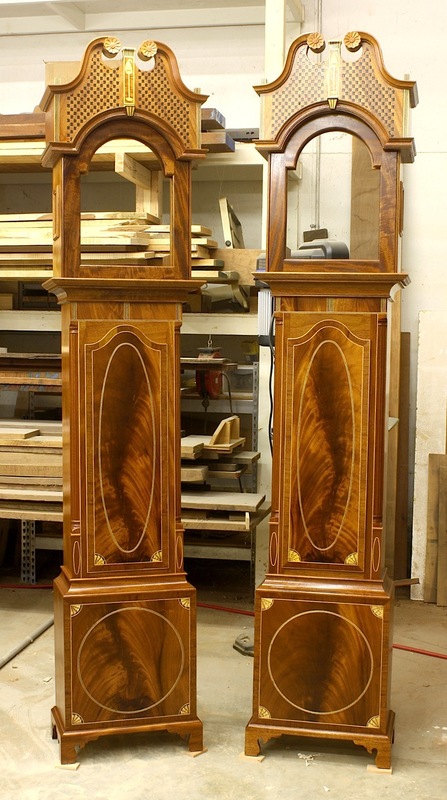 On these two clocks, the mahogany was from many sources, especially the veneered base and door fronts. I found that I needed to adjust the tones and colors. As a result, finishing without using dyes or stains becomes a bit more important. In an earlier post about the walnut secretary, I wrote about adjusting the finish using toners. 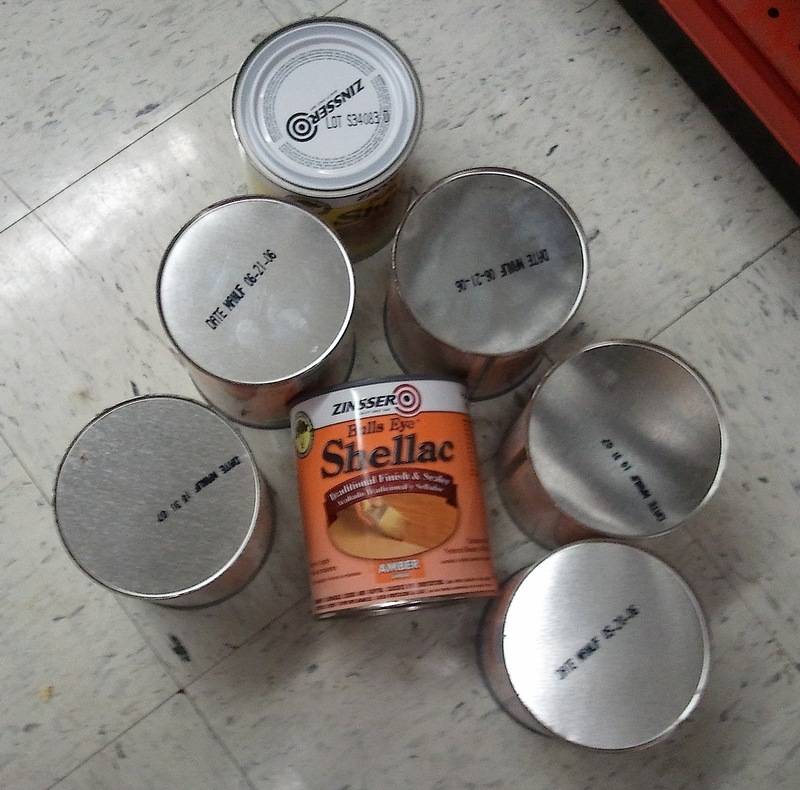 Toners, in aerosol cans, are tinted lacquer. In use the lacquer becomes layered between coats of shellac forming distinct divisions in the finish. This time, I stuck with shellac, but added drops of Transtint dye to introduce color. Shellac melts into shellac, so the finish developed is one harmonious layer. Is this better than toners? On that I’m still trying to decide, but it’s nice to have choices. The shocking revelation was that these cans were so old they were marked using the older Zinnser system of dates instead of a code. 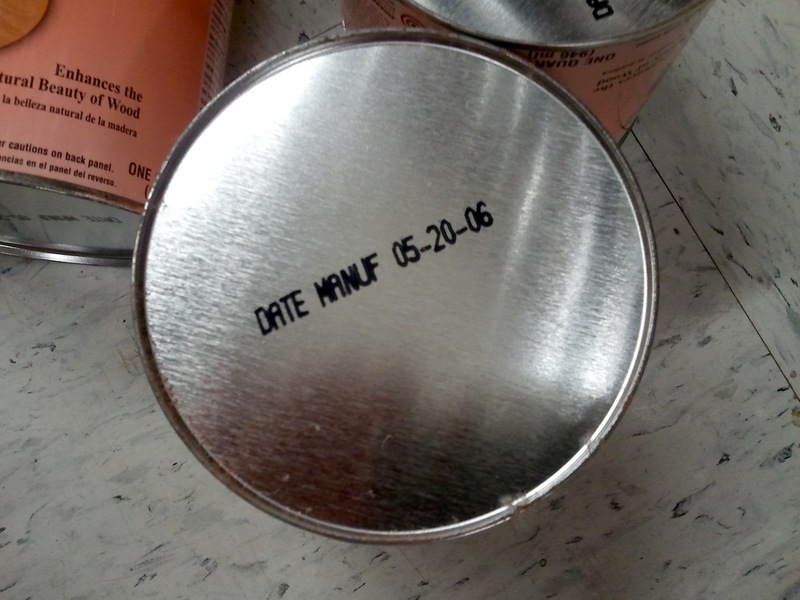 And the dates was printed on the bottom of the can, which if I remember correctly, was a full generation earlier (prior to the code, dates were marked on the lid.) A word of caution: Check the shellac cans and dates prior to any purchase and choose shellac that is less than three years old.